Looking for the perfect place to host your next special event? Guests love attending events at Dos Perros! We’ve hosted wedding receptions, baby showers, business dinners and even a book signing party. If you haven’t had the chance to peek downstairs into our private dining room, ask Mary or one of our servers to show you around the next time you stop by. If that’s not quite enough room, you can even rent out the entire restaurant. Either way, let us know what kind of event you’re hoping for, and we’ll do everything we can to make it happen for you — in style, with delicious food and top-notch service. 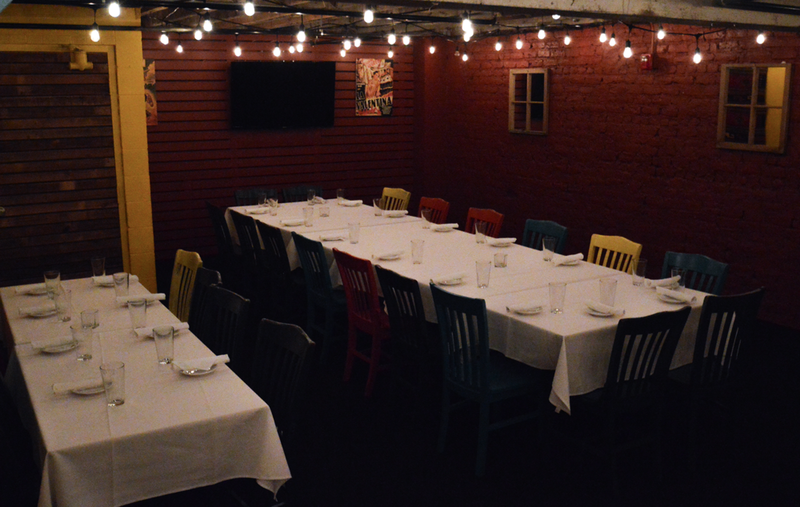 The private room is accessible via an elevator, to accommodate all of your guests. A 55″ high-definition flat screen TV is available for programming or for projecting your own presentations. The custom-made private bar can be set up with your choice of beverages. Sit down dinners will accommodate up to 55 people, while reception style events can serve 65. We have unlimited dining options and menus up our sleeve, so ultimately the choice is yours. Traditional Dinner. This option provides each guest with a choice of appetizers, entree and dessert. This is the simplest and, well, tidiest manner to take care of things. The downside, of course, is that it’s also the least interesting as people won’t get to try as many things. Here's an example of a standard dinner menu we prepared not long ago. Heavy Appetizers. This is an ideal option for parties interested in less of a sit-down dinner and more of a cocktail, “mingling” sort of affair. Here are some sample heavy appetizers (and some desserts) that our clients choose from, and from there we can work with you to decide how you’d like to proceed with beverages (we love to pair our food with craft beers, matching wines, and/or pitchers of our classic margaritas). Family Style. This is a favorite where dinner options are placed on the table and everyone shares – also good with family-style appetizers and/or desserts along with a choice of entree. The advantage of this is that everyone gets to try a lot of things and it certainly promotes the “breaking bread” element of dining together. Of course, it does make for a food-laden table and, depending on how well everyone knows one another, may be more intimate than you’d prefer. Buffet Style. This gives you the benefit of options that family style offers without the clutter and sharing factor. On the other hand, it’s less formal and does require guests to get up to serve themselves.